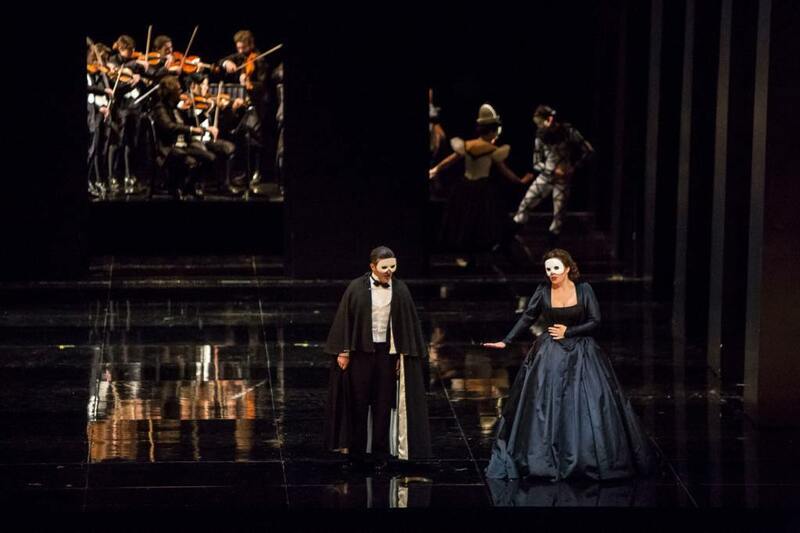 Giuseppe Verdi’s Un Ballo in Maschera (A Masked Ball), currently onstage at the Bastille Opera in Paris, has had a checkered history. The germ of the story is the assassination of King Gustav III of Sweden at a masked ball in 1792, an event with obvious theatrical appeal not only for Verdi but also for composer Daniel Auber and Eugène Scribe, whose 1833 opera Gustave III, ou Le Bal Masqué provided the basis for Antonio Somma’s libretto for Verdi’s 1859 version. Royal murder, however, was not a concept that censors in Naples, where the opera was to be premiered, felt comfortable with, so after many changes to the libretto and a move of the premiere from Naples to Rome, the action was finally set in colonial America, where Riccardo, the stand-in for Gustav, is a count and the governor of Boston. Riccardo is apparently beloved by his people, but behind the scenes are plotters who have suffered from his rule and plan to kill him at the masked ball. Renato, Riccardo’s secretary and close friend, is married to Amelia. Riccardo and Amelia have fallen madly in love, but have not yet revealed their passion to each other. In an attempt to cure herself of her love for Riccardo, Amelia visits the fortuneteller Ulrica, who has just predicted to an unbelieving Riccardo his imminent death. The two lovers meet in the dark of night and avow their love for each other but are discovered by Renato, who then joins the assassination plot. The tragedy takes place the next day at the masked ball, with Riccardo killed by the hand of his best friend. Over the past century and a half, various productions have moved the action to more plausible locations, such as Florence or Naples, but Gilbert Deflo, director of this production (dating from 2007), brings it back to Boston while time-traveling the action to the late 19th century, making Riccardo’s status as a count and governor in America absurd. With two exceptions, the stage sets and costumes, by William Orlandi, are grim and uninspired, with a simple stepped white semicircle topped by an enormous statue of an eagle or a statue of Riccardo for the political scenes, and an all-black stage for the midnight meeting of Riccardo and Amelia. The stage comes alive, however, for the visit to the red-robed fortuneteller, complete with fiery torches and sensuous dancing by Ulrica’s acolytes. A word about this scene. I was surprised to see that not only was Ulrica played in blackface (!) but that her writhing acolytes were played by black women. Why? It seems that Deflo envisioned Ulrica as a voodoo priestess (also rather absurd in 19th-century Boston, but whatever; plausibility is not required). In the program notes, Deflo confirms my suspicions of an unthinkingly racist approach to this scene, writing, “Ulrica belongs to the world of repressed intuitions. 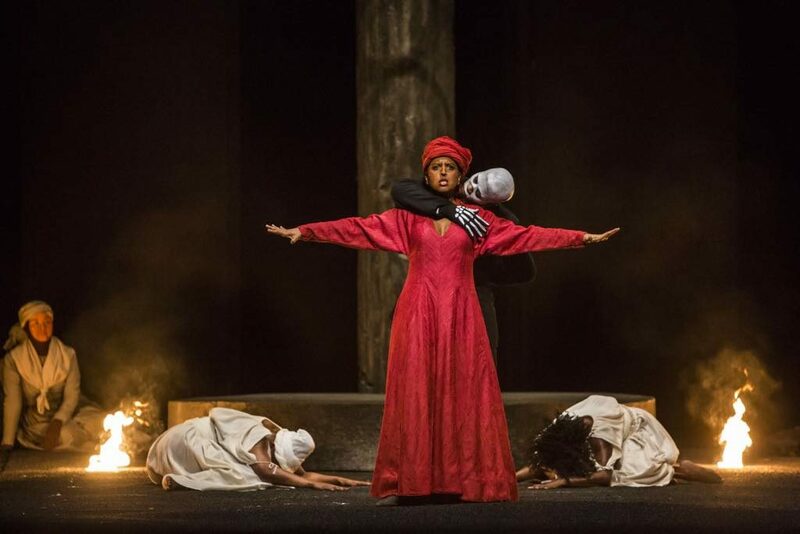 In my production, this world is represented by a chorus of black women, priestesses of the occult whose symbol is the serpent.… the symbol of a dark psyche: the domain of Ulrica.” It is shocking to come across such disparaging stereotypes even today. The other visually appealing scene is that of the ball, thanks to the dancers dressed in lighthearted harlequin costumes, although they are in black and white rather than color. And what of the singing? Soprano Sondra Radvanovsky absolutely killed it in the role of Amelia. Her performance alone is worth the price of admission. She will be replaced by the wonderful Anja Harteros on February 3, 6 and 10. The other standout was soprano Nina Minasyan in the trouser role of Oscar, Riccardo’s page. Riccardo and Renato were competently sung by tenor Piero Pretti and baritone Simone Piazzola. Mezzo-soprano Varduhi Abrahamyan was a convincing Ulrica. The orchestra, ably conducted by Bertrand de Billy, was in fine form.